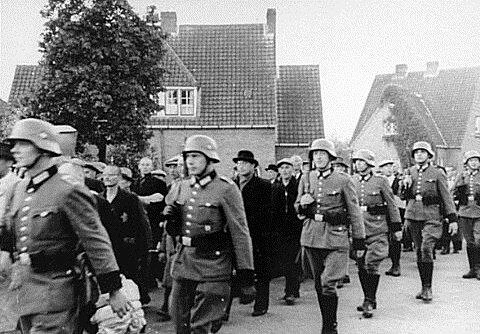 German soldiers round up Jews in occupied Holland. By the summer of 1940, the Nazis controlled much of western Europe – including eastern France, the Netherlands, Belgium, Luxembourg, Denmark, the Baltic states, Norway, Austria, Czechoslovakia and the western half of Poland. This occupation would not change significantly until the D-Day landings and Soviet invasion of 1944. Europe under the Nazis was governed firmly, brutally and for benefit of the German war effort. It was under this cloak of war and military occupation that the SS began to carry out the Final Solution to the ‘Jewish problem’. Control of occupied territories was of course critical. The Nazis often left local governments in place, provided they were either sympathetic or could be easily manipulated. Each occupied nation was appointed a Gauleiter – a senior NSDAP official who ruled in the manner of a governor. 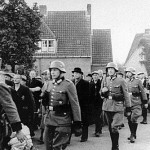 The level of control and force wielded in each occupied country was often based on Hitler’s personal perception of it. Nations with large populations of Aryans, like Norway and Austria, were treated comparatively better than countries with sizeable Jewish and Slavic populations. Anyone in an occupied territory who resisted or criticised the Nazis was removed from power, detained in concentration camps or forced labour. In December 1941 Hitler signed the notorious ‘Night and Fog Decree’ that authorised summary executions for anyone caught campaigning against or resisting Nazi rule. This was usually done in secret: those executed were said to have “disappeared into the night and fog of Germany”. The main function of Nazi occupation was to supply the German war effort with resources and labour. Berlin sent economics experts into each occupied territory, to decide how its domestic economy could be harnessed and put to work for Germany. Owners of mining companies, factories and manufacturers were forced to sign contracts to supply the Nazi war machine with resources or goods, usually at very low rates. Wages were fixed at low levels (around 20 percent less than before the war) and prices were sometimes controlled. The Nazis also imposed restrictions on labour. As in Germany itself, there was very little free movement of labour; each person was given a workbook and an identity card then allocated a job. As the war progressed, the authorities in some Nazi-occupied countries introduced labour conscription. Locals could even be forced to relocate to Germany for work. Non-workers had to carry identity papers and there were restrictions on movement, such as checkpoints and curfews. Most local newspapers continued to operate but were placed under the control of local Nazis or sympathisers. There was a ban on publishing ‘bad news’: information about German defeats or articles about the resettlement or deportation of Jews. Locals were even forced to salute SS officers or high-ranking Nazi Party members. The most brutal Nazi occupation was in Poland. In September 1939 the Polish state was divided in two, with the invading Germans occupying the western half and the Soviet Red Army occupying the east. Hitler’s policy view towards Poland was not one of occupation but of ‘Germanisation’. He appointed Hans Frank, the party’s fanatical lawyer, as Gauleiter of the Generalgouvernement (‘General Government’, the Nazi term for occupied Poland). One of Frank’s first priorities was Operation Intelligenzaktion, or the liquidation of Poland’s intelligentsia. For six months, squads of einsatzgruppen marched Polish aristocrats, academics, teachers, judges, lawyers, priests, politicians and writers into remote forests and shot them in cold blood. Though Intelligenzaktion was not specifically anti-Jewish, many of the 60,000 people killed were Jews. The Catholic Church in Poland was also targeted: four-fifths of Catholic priests and nuns were either killed or deported to concentration camps. 1. The Nazis had occupied most of western Europe by mid-1940, including Poland, France, Holland and Norway. 2. These countries were placed under the governorship of Nazi officials, often with sympathetic or puppet regimes. 3. Economies in occupied countries were forced to assist the Nazi war effort, with cheap supplies and labour. 4. There were also social restrictions, such as control of the press, obligatory identity cards, checkpoints and curfews. 5. Poland was worst treated, its intelligentsia murdered, its large Jewish population forced into ghettos and slave labour.